In a previous article, we explained the huge difference between Over 5 and Over 5.5 when it comes to NHL Over Under betting, and gave 3 reasons why that’s the case. In this article, we’re showing you yet another reason you might want to think twice before betting Over 5.5 in an NHL game. Nice solution, right? Aren’t we making it even harder to win the bet? Okay, fine, it’s harder to win the bet when you take Over 6 instead of Over 5.5. But you aren’t losing more bets by taking Over 6 instead of Over 5.5 – you’re just pushing on the ones where there are 6 goals scored instead of winning them. Plus, you’re getting better odds. Well, duh. But we still point this out because the better payouts are why you might want to consider betting Over 6 or Over 6.5 instead of Over 5.5. You’ll push your bet instead of win if the game ends 4-2, 5-1 or 6-0, but you’ll get a much better payout on games in which each team scores at least 3 goals (guaranteeing there will be at least 7). And it seems the odds of a game finishing 4-3 are actually much higher than the odds of a game finishing 4-2. If you use a sportsbook that offers alternate lines on NHL totals, you should be able to bet Over 6 or Over 6.5 instead of Over 5.5 pretty easily. (All the top NHL sportsbooks we recommend do, except for BetOnline – and Bodog only offers alternate totals of 4.5, 6.5 and 7.5, not 5 or 6). And look at how much more you can win on a fairly similar bet! In the above example from 5Dimes, you can see the Over 5.5 pays +120 odds and the Over 6 pays +150 – an extra 20% on your winnings. Bump the Over up to 6.5, and you can now get a +175 return. But are the bigger payouts enough to offset the times you push instead of win, or lose your Over 6.5 bet when the game ends with 6 goals? When we were researching the article we wrote on the difference between betting Over 5 and Over 5.5, we looked at 523 games from the first 2.5 months of the 2016-17 season. 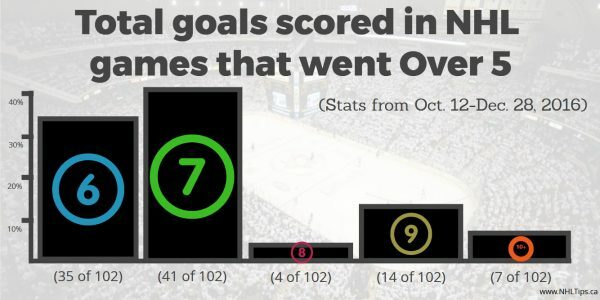 Of those 523 games, 210 of them either went Over 5 or Over 5.5 – meaning there were 6+ goals scored in all of them. 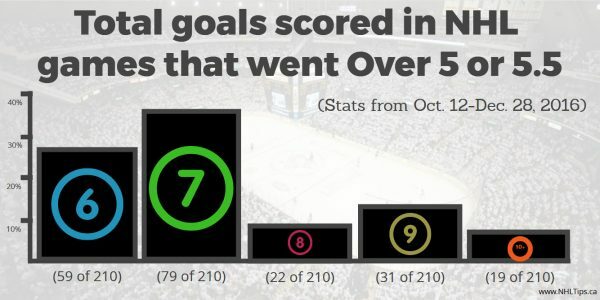 In order to have exactly 6 goals scored in a game, there are only a few possible score combinations: 6-0, 5-1, 4-2, 2-4, 1-5 and 0-6. Question: What do those scores all have in common? 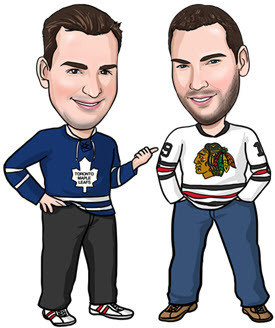 Answer: They’re games that were decided by more than 1 goal – which has become quite rare in the NHL these days. Just consider that nearly 24% of NHL games have been decided in overtime over the past 5 seasons alone, which guarantees a 1-goal margin of victory. If you’re betting Over 6 instead of Over 5.5, the only way you’ll push that bet instead of win it is if the game is decided by more than 2 goals – which happens less than half the time. Getting an extra 30 cents per dollar (or more) by wagering Over 6 instead of Over 5.5 could make up for the times you push instead of win. And if you bet Over 6.5 instead of 5.5, you’d have lost 18.48% more bets in those 523 games we looked at in the first half of the 2016-17 season, but you could have won approximately 40% more money each time you won those bets. So Should You Just Take Over 6 or Over 6.5 Every Time Instead Of Over 5.5? We wouldn’t quite go that far. The first thing you should consider is the odds. So if the Over 6 is only paying 20 cents more than the Over 5.5 (for example, Over 5.5 is +110 and Over 6 is +130), you’re really not getting rewarded that much for decreasing your chances of winning the bet. But if the Over 6 pays 40 cents more than the Over 5.5, it’s definitely worth looking into. The other thing you should consider is whether you expect a competitive game or not. If both teams have a good chance of scoring 3 goals, the Over 6 and Over 6.5 become more attractive because if each team gets to 3, you’re guaranteed a 7th goal. But if it’s a one-sided game, you don’t want to find yourself needing 1 more goal to cash your ticket when the score is 5-1 and both teams are just mailing it in in the third period.